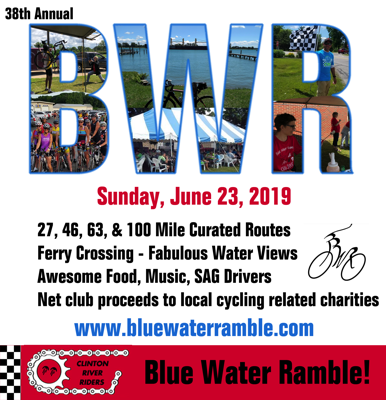 The 38th annual Blue Water Ramble on June 23rd, 2019 includes a tour of the beautiful Blue Water Region with views of the St. Clair River. 27, 46, 63 and 100 mile route options available. ALL routes will take a ferry onto Harsens Island, where riders will experience low traffic and breathtaking views. Perfect for family and novice riders, or advanced riders looking for a great route thats well supported. Century route provides a challenge and a spectacular view of the Blue Water Bridge. This ride proudly supports the LMB $1 per rider program - we give $1 of your registration fee to LMB for Bicycle Education & Advocacy. Proceeds from past BWR events went to multiple cycling causes. Start Location: Algonac High School at 5200 Taft Rd in Algonac, Michigan, and will take place rain or shine. 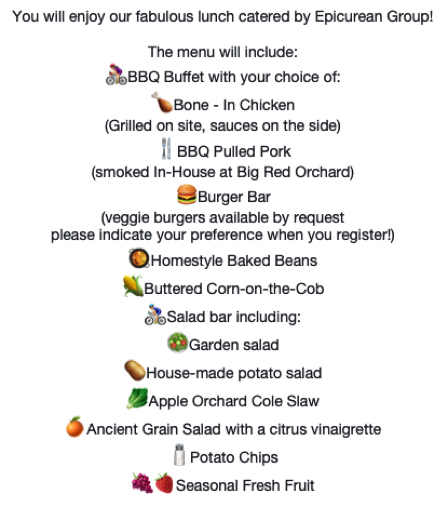 Catered lunch (see details below) at the end of the ride, including vegetarian options. Music and massages will complete your fun filled day. Rest stops and SAG support included. Local bike shops will be present to assist with mechanical issues. The routes include distances of 27, 46, 63, and 100 miles. The 27 mile route is designed for those who want less miles and less traffic, on Harsens Island. All routes are paved and well marked; maps will be provided. Routes will include SAG, mechanical support and rest stops with food, fruit and drinks. ALL routes (INCLUDING the century this year) will go onto Harsens Island via the car ferry. The island portion of the ride is approximately 25 miles and offers great views of the river and bay. A rest/food stop will be positioned at the 17 mile mark. All routes open at 7 am and close at 4 pm. All cyclists riding the 100 mile route must start no later than 8:00am. All other cyclists must start no later than 10:00 am. SAG wagons will be available to assist riders on ALL routes during the day and will make a final sweep of all routes at 4 pm. Transportation across the St. Clair River by commercial ferry to Harsens Island is included. Each rest stop will include food, drink, restrooms and assistance if needed. Lunch will be at the end of the ride at Algonac High School and closes at 4pm. ENTERTAINMENT – lively music and more!